3: Short story excerpt in printed and audio formats, Peretz’s “Bontshe shvayg,” 1894 et al., Yiddish with English translations. From resource kit: I. L. Peretz's "Bontshe the Silent"
Several scholars have pointed out the striking differences among the many English translations of Peretz’s story. A few of the most starkly different translations of the conclusion of the story are presented here, along with the original version in Yiddish, as well as audio versions in both English and Yiddish. Suggested activity: Have the students read along with one translation while playing the Yiddish audio. Have them read aloud the other translations, and, with all the translations in front of them, discuss the similarities and differences. 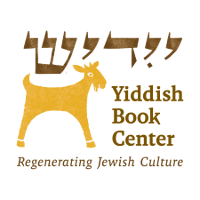 If any students are able to read Yiddish, have them compare the translations to the original. Discuss the elements of the translations that change—most noticeably of all, perhaps, Hilde Abel’s addition of the phrase “in shame at this unending meekness they have created on earth”—and ask students which version aligns most closely to their understanding of the story. Sources: Yiddish text from Di verk fun yitskhok leybush perets (The Works of I. L. Peretz), vol. 4, Ertseylungen (“Short Stories”) (1904), 14; Helena Frank translation in Isaac Loeb Peretz, Stories and Pictures (Philadelphia: The Jewish Publication Society of America, 1906), 181; Moshe Spiegel translation from I. L. Peretz, In This World and the Next: Selected Writing (New York: Yoseloff, 1958), 65; Hilde Abel translation in Irving Howe and Eliezer Greenberg, eds., A Treasury of Yiddish Stories (New York: The Viking Press, 1954), 230; English audio read by Harold Gould in Joan Micklin Silver, dir., The Complete Jewish Short Stories from Eastern Europe (Yiddish Book Center/KCRW, 1995), disc 1; Yiddish audio read by Miriam Kressyn in “Dray matones un andere dertseylungen” (Montreal, QC: Jewish Public Library, 1980s-90s), track 2, Yiddish Book Center’s Sami Rohr Library of Recorded Yiddish Books, <https://www.yiddishbookcenter.org/collections/audio-books/smr-249I.L.PeretzDrayMatonesThreeGifts.ReadByMiriamKressynYID_201312>, accessed May 20, 2018.